Nature also uses multiple fractal iterations of the phi spiral in the manifestation of a single form. 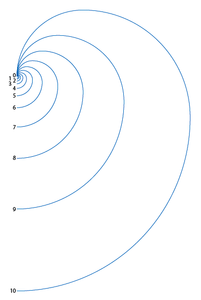 Here it is important to note that there is really only ONE phi spiral that expands infinitely from a given center point, and this spiral can be used in segments of any group of 4 nodes to create discrete arcs (and boundary conditions) of varying magnitudes of scale. In the case of the sunflower depicted in Illustration 9 below, there are two spirals rotating around a common center in opposite directions (a double spiral). 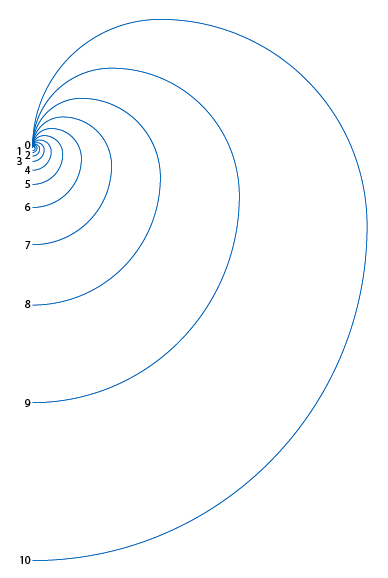 The counter-clockwise spiral (ccw inwards to the center) has 34 iterations, while the clockwise spiral has 55 iterations. (Note that 34 and 55 are an adjacent pair of the Fibonacci Sequence numbers, an example of understanding how nature uses phi from the Quantity perspective). The two spirals have different arcs, though — the ccw spirals are very steeply curved and long while the cw spirals are much less curved and shorter. 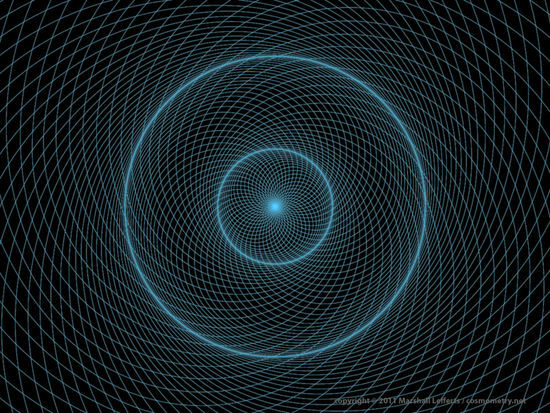 This is because nature is using two scales (fractal iterations) of the phi spiral starting at different nodes, both having the same center point. In this case, using a source spiral with 13 nodes, the ccw spiral is rotated around Node 4 as the center point (and is the scale of the seed head’s boundary condition), and the cw spiral is rotated around Node 6 as the center point. The Node 6 spiral is two fractal iterations of the phi ratio larger than the Node 4 spiral, and is therefore “less curved” when the two are centered on the same point (though in fact it has the same curve as the Node 4 spiral, just larger in size). 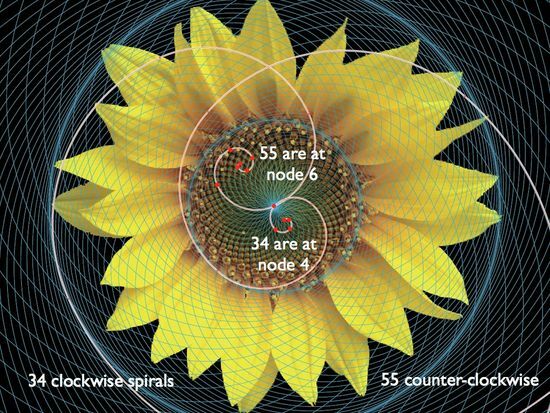 Not only is nature using two Quantities of phi (34 and 55 spirals), but it is also using two Scales (or frequencies, when seen as wavelength phenomena) in order to organize the seeds of the sunflower into the most efficient growth pattern possible. Another significant phenomenon to note is that when we observe the larger boundary condition created by the Node 6 spirals (or vortex, more correctly), we see that it very closely aligns with the outer tips of the sunflower’s petals as they extend outward from the seed head. This suggests that nature has combined two fractal iterations of the phi vortex into one integrated double spiral field pattern that perfectly balances the ratios of the seed head and the flower petals while creating the most efficient array of seeds to carry on the genetic thread of life.